The origin of the breed is of such antiquity, and the earliest descriptive names so mixed that it is unclear as to whether the Deerhound was at one time identical with the ancient Irish Wolfdog. Very early descriptive names were used to identify the purpose of the dog rather than to identify a species. 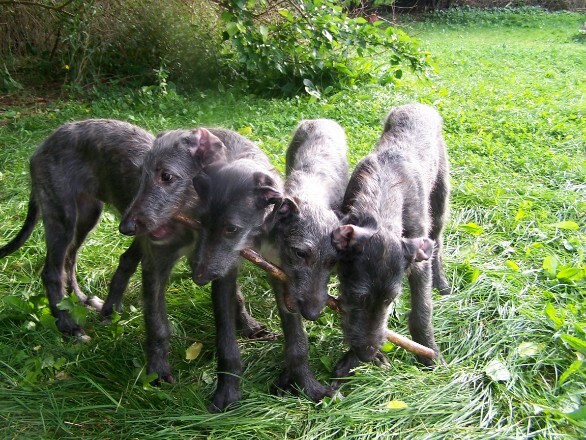 We find such names as Irish Wolf Dog, Scotch Greyhound, Rough Greyhound and Highland Deerhound. We can definitely identify the breed as Deerhounds as early as the 16th and 17th centuries. From there on the term Deerhound has been applied to the breed, which of all dogs has been found best suited for the pursuit and killing of deer. At all times great value has been set on the Deerhound. The history of the breed teems with romance increasing in splendour right down through the Age of Chivalry when no one of rank lower than an earl might possess these dogs. So highly esteemed was the Deerhound that the desire for exclusive ownership has at times endagered the continuance of the breed. As the larger beast of the chase became extinct or rare in England and southern Scotland, the more delicate, smooth Greyhound took the place of the larger Deerhound. The Highlands of Scotland, the last territory wherein the stag remained numerous in a wild state, became the last stronghold of this breed. In 1769 the breed physically and numerically ran very low. It was not until about 1825, when the restoration of the breed was very successfully undertaken by Archibald and Duncan McNeill, that the Deerhound regained his place of pre-eminence and former perfection. It is a well-established fact that the Scottish Deerhound of today closely conforms to authentic records of the 18th and 19th centuries in type, size and character. In character he is quiet, dignified, keen and alert, although not aggressive, has great persistence and indomitable courage. Rowan's litter mates having fun!